New American Library. Used - Like New. Like New condition. Mentor 275. Used - Good. Good condition. 1994-07-02. Good. Ships with Tracking Number! INTERNATIONAL WORLDWIDE Shipping available. May not contain Access Codes or Supplements. May be ex-library. Shipping & Handling by region. Buy with confidence, excellent customer service! Mentor. Used - Good. Good condition. Barnes & Noble, 1996-01-01. Hardcover. New. Hardcover with DJ. An Unused, unmarked and unblemished copy. ; 100% Satisfaction Guaranteed! Ships same or next business day! Barnes & Noble. Hardcover. 0760702683 New Condition. . New. Cleveland: World Publishing Company. 1957. First Edition; First Printing. Hardcover. Book condition is Very Good; with a Very Good price clipped dust jacket. Edge wear to jacket, including a few tears. Text is clean and unmarked. ; 8vo 8" - 9" tall . Weidenfeld and Nicolson, 1961. This is an ex-library book and may have the usual library/used-book markings inside.This book has hardback covers. In fair condition, suitable as a study copy. No dust jacket. The World Publishing Company, Cleveland: 1957. Hardcover, no dustjacket. Good condition. Here is the grandeur that was Greece -- its magnificent achievements in art, philosophy, government , science, religion . . . from the time of Homer to the fall of Athens. With forty-eight pages of photographs. World, Cleveland & New York: (1957)., 1957. 210p. + Photographic illustrations. 8vo. DJ. Excellent survey of Greek classical culture. This Marboro book club edition apparently is the true first American edition. The text was previously publishe d in England. W121. F. Hardcover. Barnes & Noble. Hardcover. 0760702683 Like New Condition. . Fine. Praeger (1969). Used - Good. Former Library book. Shows some signs of wear, and may have some markings on the inside. Praeger (1969). Used - Very Good. Former Library book. Great condition for a used book! Minimal wear. Praeger (1969). Used - Good. Ships from Reno, NV. Former Library book. Shows some signs of wear, and may have some markings on the inside. 100% Money Back Guarantee. Shipped to over one million happy customers. Your purchase benefits world literacy! Praeger (1969). Used - Good. Ships from the UK. Former Library book. Shows some signs of wear, and may have some markings on the inside. 100% Money Back Guarantee. Your purchase also supports literacy charities. N. Y.: Mentor, 1959. Used - Good. Ships from the UK. Former Library book. Shows some signs of wear, and may have some markings on the inside. 100% Money Back Guarantee. Your purchase also supports literacy charities. New York: Barnes & Noble, 1996 Book. Very Good. Hardcover. VG in VG DJ; top edge foxed, small smudge on bottom edge; o/w clean 7 tight. Cleveland: World Publishing Company , book club edition. (Hardcover) 210pp. plus 64 plates. Very good in good to very good dust jacket. Illustrations, notes, index. Dust jacket worn and spine faded. Locale: Greece. Series: World History of Civilization. (History--Ancient, Antiquities, Classical Studies). London: Weidenfeld and Nicolson, 1959. 64 b/w plates. 211 pp. Beige endpapers. Green cloth with gilt titles. Head and tail of spine lightly worn, corners lightly bumped. Illustrated DJ, not price-clipped. Chips, wear along the edges. VG+/VG. Hard Cover. 8vo - over 7¾" - 9¾" tall. Weidenfeld and Nicholson, 1957. Hardcover. Good/Acceptable. 1957. 211 pages. Pictorial dust jacket over green cloth. Contains 64 black and white illustrations. Pages are bright and clear, with light tanning and foxing to pastedowns and endpapers. Cracked guttering to plate 15, with exposed netting. Boards are slightly warped, with light bumping to corners and crushing to spine ends. Heavy rubbing and marking to surfaces. Unclipped jacket is heavily worn, with large tears and creases. Heavy chipping to edges, with tanning to spine. Light sunning to surfaces, with heavy rubbing overall. 1 . hardback. Very Good. Illustrated. 1st ed. London (Weidenfeld & Nicolson) (1957). Minor marginal pencillings, and some bubbling of cloth, else a very good copy. Phoenix, Great Britain, 1994. XII, 210, (1) p. 8vo. Text in English. 16 b/w plates. VG copy. Letter D stamped on bottom edge. Binding is soft cover. Original illustrated wrappers, in VG condition. .
New American Library. Used - Good. Ships from the UK. Former Library book. Shows some signs of wear, and may have some markings on the inside. 100% Money Back Guarantee. Your purchase also supports literacy charities. New York: Praeger, 1969. Hardcover. Fine/Good. First edition. Fine in good dustwrapper. Dustwrapper is very torn and taped, worn looking, sticker, yellowing. Please Note: This book has been transferred to Between the Covers from another database and might not be described to our usual standards. Please inquire for more detailed condition information. London: Phoenix, 1957 "A brilliant survey of classical culture and history from the time of Homer to the fall of Athens in 404 BC." 210p. plates. index. Re-issue. Soft Cover. Fine. Cleveland & New York: World Publishing, 1957. Second printing, 8vo, pp. xiv, 210, ; 107 illus. on rectos and versos of 32 plates; spine of dust-jacket slightly faded, else near fine throughout. Very Good. World Pub. Co; [1st ed.] edition (1958). NF in G-, unclipped DJ. Blue topstain. No reader's marks except eraseable pencil marks on perhaps 10 pps. The World Publishing Co., 1957. Large, heavy book, red-brown cloth with embossed illustration of horse and spearman on front, tiny creases at top front tip, 210 lightly browned heavy pages with photo section on photo paper. DJ glossy brown background with illustration of statue on front as well as corn and warrior, spine very slightly faded as well as front left, white back very slightly and uniformly browned. DJ has microtear and slight wear at top front tip, micronick and tiny tears with creases and slight wear at top front edge, 1/2" jagged tear with slight wear at bottom front tip, microtears and micronicks at spine bottom edge, micronicks and tiny tear at spine top edge, micronick and tiny creases at top back edge, microtear at bottom back edge, tiny nail-tear at front spine indentation near bottom. Near Good DJ/Fine book.. Cloth. Fine/Near Good. First edition. History of Civilisation series. xiv, 211 pp. With 64 pages of stunning b/w photographic illustrations. 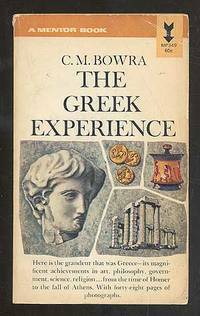 An account of Ancient Greece in which the author gives us a summing-up of the whole Greek achievement. It covers the centuries between the time of Homer and the fall of Athens in 404 BC, including politics and government, poetry and drama, philosophy and science, religion and mythology. Dark green cloth boards with gilt lettering on red background on spine. Red background and lettering rubbed away in places. Overall condition VG. In Poor torn dust wrapper. Weidenfeld & Nicolson, 1958. Green cloth binding with pink top edge stain, unmarked text, well worn dustjacket with edgwear. Part of History of Civilisation series.. 2nd Printing. Hard Cover. Very Good/Very Good. Illus. by 64 Page Section. 8vo - over 7¾" - 9¾" tall. Cleveland:: World, 1957. 1st edition, 1st printing.. hardcover. very good with very good dust jacket. 8vo. xiv+211pp. large photo plate section.. light soil. Professional used bookstore open to the public since 1988. 30 Years of Bookselling Experience backing the careful selection and description of each book we offer. Condition: very good with very good dust jacket. 8vo. xiv+211pp. large photo plate section. Edition: 1st edition, 1st printing. (New York): The New American Library, 1964. Very Good. Fifth printing. Very good copy in moderately soiled wrappers with creases on the front wrapper. New York: New American Library, Inc, 1957. Very Good. Sixth printing. Illustrated. A mildly age-toned text block, a tanned spine and general wear thus very good in wrappers. Hardcover. (Very Good or better unless otherwise noted). NY, 1957, 195p., illus.